Hello everyone! Joni here with the winner of the Get Sketchy Challenge #3. Again, I wanted to say thank you so much to everyone who participated in our Get Sketchy Challenge. You guys did another amazing job with the sketch and there are truly some gorgeous creations! Thank you so much again everyone! Don't forget, our next Get Sketchy Challenge will be November 8th, 2015. Before we get started, we have a winner to announce! Congratulations entry #12 - Anita in France! Ready for another challenge? After taking a month off, I'm back with another Throwback Thursday Challenge! This month we are revisiting the adorable "Pretty Patches" series and Country Charm. 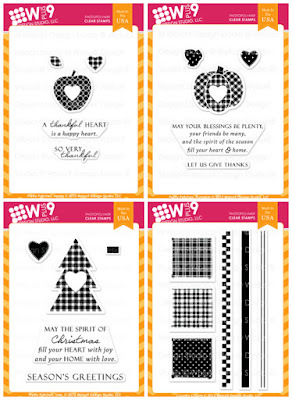 The Pretty Patches stamp sets are adorable and affordable at only $6 each. 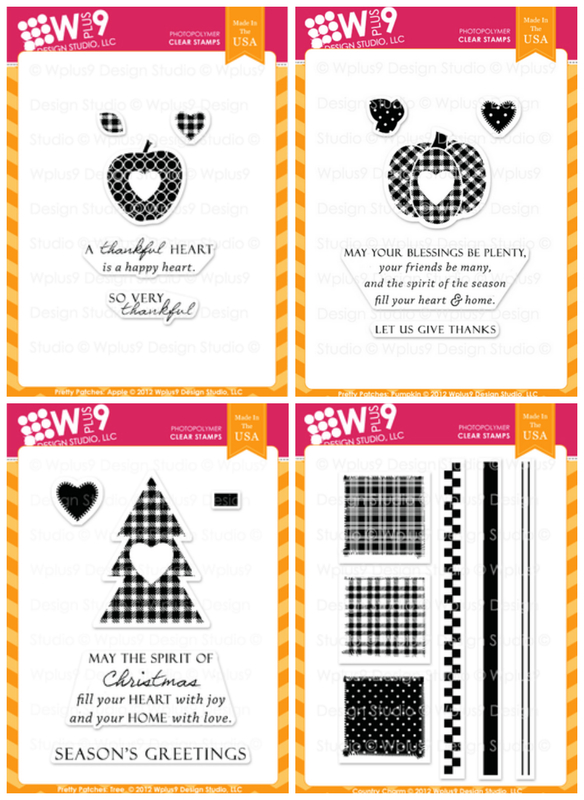 Each set has an image and two sentiments, one can be used on the inside and one for the outside. The beginning stamper can quickly build up a supply of products for many different occasions by purchasing the Pretty Patches stamp sets. Usually I would begin with the first card I made and make my way to the last, but because these are seasonal cards, I feel like I should begin with Pretty Patches: Apple! All of my cards today feature the Love Showers Layers die as the focal point. 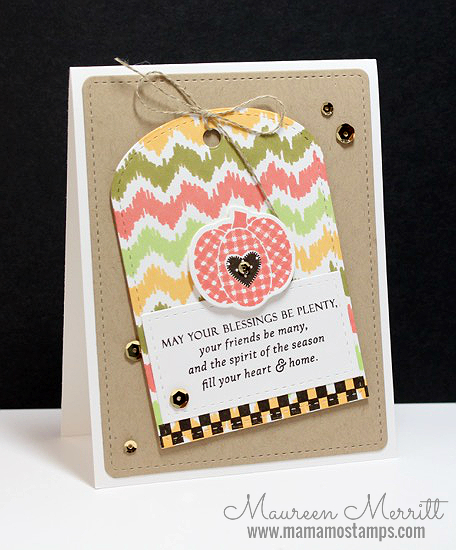 I began this card by stamping the Ikat background on Kraft card stock. Next I die cut and inlaid a Nautical Navy Pinking Square. The apple was die cut and stamped with Cranberry Crush ink then adhered to the card with foam tape. I stamped the double line border in Nautical Navy ink on the top and bottom of the card base. I love the way that finishes off the card. On this next card, I stepped up the design a bit by adding an extra layer. I stamped the tag again with the Borders & Backgrounds 1 stamp set, then just added the one border from Country Charm. I love how that grounds that stamped label. And finally, this is my favorite of my cards today. I used the Country Charm stamp set to stamp my own plaid paper. 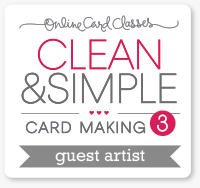 It was so easy and just a great way to personalize your cards. The sketch will run from September 8th thru September 29th and we will announce the winner on September 30, 2015. We only ask that you use ONE Wplus9 product on your wonderful project to be eligible for the prize of a $20 store credit at wplus9.com, which you can use however you wish. But of course, you may use as many Wplus9 products as you'd like! For my take on the sketch, I stamped the images from the Wplus9 Smart Kitty stamp set and colored the images with Copic markers. After coloring with markers I adhered the ombre patterned paper from My Mind's Eye Market Street "Ashbury Heights" 6x6 paper pad. Then I stamped the sentiment, also from the Smart Kitty stamp set with Versamark ink onto a brown scrap paper and heat embossed it with white embossing powder to help it stand out on the top panel. To finish off the card I added some Pretty Pink Posh sequins in Tangerine and Sparkling Clear. We will select one random participant to receive a $20 store credit to wplus9.com. The winner will be posted here on the blog on September 30, 2015.